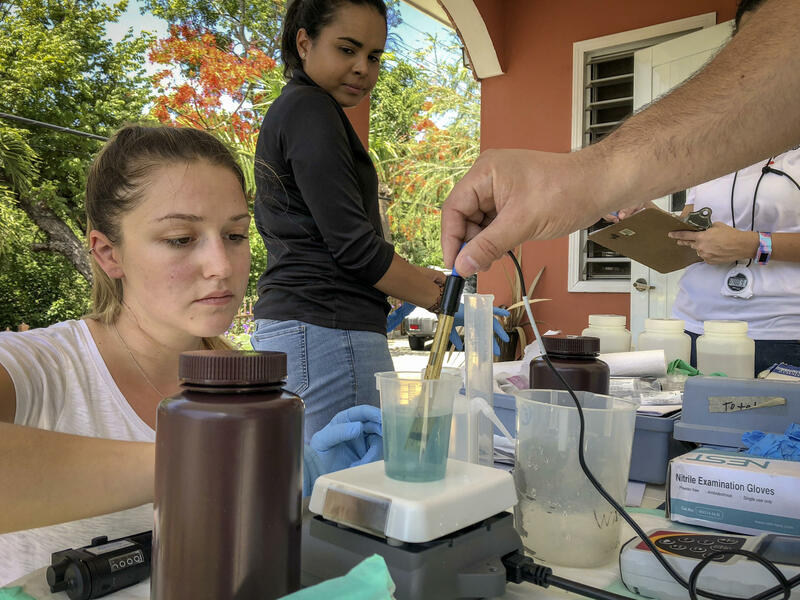 Drinking water samples from homes in southwestern Puerto Rico are tested at Interamerican University of Puerto Rico in San German. People who lost access to water in the wake of Hurricane Maria gather at pipes carrying water from a mountain creek, on the side of the road in Utuado, Puerto Rico, in October 2017. Graduate student Melanie Warren and laboratory technician Taina Rodriguez Curet work with Fernando Rosario-Ortiz to test tap water samples in Puerto Rico for lead. Initial results suggest potentially dangerous levels of lead in some drinking water that Rosario-Ortiz hopes to investigate further in larger studies. Lugo is concerned about contamination. And she's not alone. For decades, the island's water authority has racked up fines and violations for failing to adequately test the tap water for bacteria, chemicals, and other contaminants, breeding distrust and potentially contributing to waterborne disease. 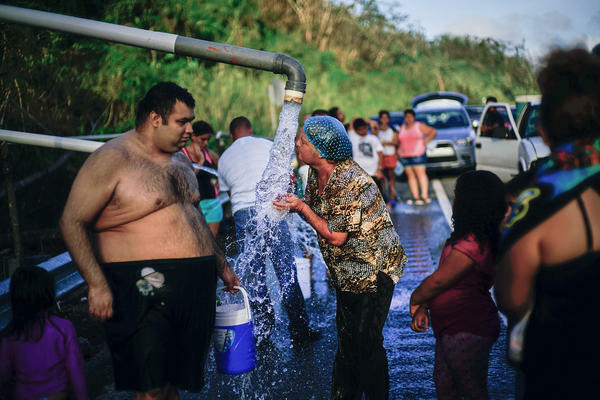 "Unfortunately Puerto Rico has the worst record in the U.S. for drinking water safety," says Erik Olson, a senior health policy advocate at the Natural Resources Defense Council. And it's not just bacteria and viruses. The most recent federal data shows widespread failures to monitor and report another contaminant: lead. According to data reported by the island's water systems between January 2015 and March 2018, 97 percent of Puerto Rico's population is served by a local drinking water system with at least one recent violation of the Safe Drinking Water Act's lead and copper testing requirements. That is far higher than any U.S. state. "Virtually everyone on the island is getting water from systems that violate testing or reporting requirements," says Olson, a former lawyer at the Environmental Protection Agency who specialized in drinking water regulation. "It's sort of a see-no-evil, speak-no-evil kind of situation where, if you don't test the water as the law requires, you're not going to know if you have a big problem." When Hurricane Maria slammed Puerto Rico last year, the storm damaged reservoirs and knocked out power to water pumps, leaving many people dependent on bottled water for months, and more skeptical than ever about the island's tap water. A new push to start testing more of Puerto Rico's water is one small silver lining to come from the hurricane. The National Science Foundation has funded a small set of studies of the water. Fernando Rosario-Ortiz, a chemistry professor from the University of Colorado, Boulder, specializing in wastewater chemistry, has led two rounds of initial testing showing possible lead contamination significant enough to warrant further study. He's applying for a grant to fund a larger study. As part of the testing, Rosario-Ortiz and his team went door to door in Puerto Rico gathering bottles of water from people's bathroom sinks. Rosario-Ortiz grew up in Puerto Rico and, after Maria, he set out to help by testing drinking water. "I grew up here. I drank water out of the tap every single day of my life," he says. "There were some reports of bacterial contamination, so we started by testing for that." But Rosario-Ortiz found something else. "When we got the data back we noticed that some of the levels of lead were elevated," he explains. It was concerning, but the number of samples was small; they would need more information to know whether what they were seeing was an isolated issue, or the tip of an iceberg. 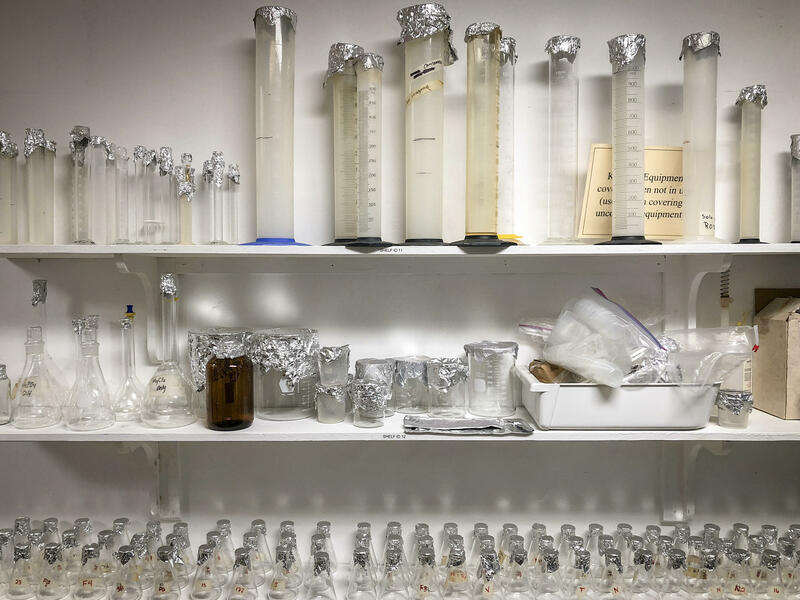 Under the 1974 Safe Drinking Water Act, water utilities are required to test for lead and other metals in the water, and to report the results to both consumers and to the federal government, which publishes the data. If Puerto Rico's major water utility, known as PRASA, had been testing as required, it would be easy to see where Rosario-Ortiz's lead data fit in the larger picture. But much of the data was missing. "There's a fair number of lead and copper rule violations that seem to be mostly lack of sampling," says Rosario-Ortiz. "A lot of people in Puerto Rico have been living for a long time without information, about whether there may be elevated levels of lead." That makes it difficult for residents to trust what comes out of their taps, even if it is, indeed, safe to drink. The lack of information can be particularly worrisome for parents of small children, whose development can be affected by lead exposure. A 2017 study of blood lead levels in Puerto Rican children under 6 years old found a prevalence of elevated lead levels similar to that in New York City. But the authors noted that, while lead paint accounts for much of the problem in New York, the source of lead for Puerto Rican kids is unknown, and requires further study. "We don't know what effect high levels of lead are having in people, or in kids in the community, because it's not tested," explains Graciela Ramirez-Toro, the director of the Interamerican University of Puerto Rico's Center for Education, Conservation and Environmental Studies. "One of the things that might have resulted positive from the hurricane is people are testing [the water]." Although the Safe Drinking Water Act is a federal law, responsibility for enforcing it largely falls to state and territorial governments. That places a lot of responsibility on utility executives, like the executive president of Puerto Rico's public water utility, Eli Díaz-Atienza. "Do I think it's a problem that we're not doing testing ? Yeah, I think it's a problem," says Díaz-Atienza. But, he says, the federal data make the problem seem worse than it is, because federal law requires that the utility test the drinking water at specific times. But in Puerto Rico, there isn't always water to test. Compared with other parts of the U.S., water service is unreliable on the island. Filters clog, pipes leak. Some estimates suggest more than half of the water that leaves treatment plants never makes it to customers. When the utility is making repairs, they turn off the water. And when the water is off, they don't test it. Díaz-Atienza says he thinks the data should be adjusted for that. In fact, he goes a step further. Asked how he would describe the current state of Puerto Rico's drinking water system, he says, "I would grade it one of the best functioning systems in the U.S." He notes that after Maria, his employees restored service to many communities within days, trucking fuel to start generators that would run pumps all over the island. And, of all the potential contaminants that the utility is supposed to test for, lead is not Díaz-Atienza's top concern. "We haven't seen situations of lead contamination in our system," he says. Unlike cities with water systems built at the turn of the last century, when lead was commonly used in some water pipes, in Puerto Rico "we don't have that much old [piping]," he says. But lead contamination doesn't have to come from public pipes. In fact, according to the Centers for Disease Control and Prevention, "lead found in tap water usually comes from the corrosion of older fixtures or from the solder that connects pipes." And lead solder is common in some Puerto Rican communities, as it is all over the country. While it's not the utility's responsibility to test the water in every home, in the wake of the 2014 water crisis in Flint, Mich., states and utilities are supposed to be testing some tap water in order to identify lead service lines leading to houses, and make sure the water they distribute is being treated in a way that minimizes the risk of corrosion. Based on the public data, that doesn't appear to be happening in Puerto Rico. It is unclear whether the hurricane, and the attention it's drawn to Puerto Rico's water infrastructure, will ultimately result in better compliance from the major water utility. Officials are "very worried that this data will increase the belief that they are not doing their job, or that the water is not safe," says Ramirez-Toro of Interamerican University of Puerto Rico. But, she says, public distrust is already so high that transparency about drinking water testing is a good thing, even if the data suggest that drinking water might not be entirely safe. "This helps people make decisions about their health," she says. "For most people, they are not used to thinking about the water, except that they don't trust it." And, while Puerto Rico is singular in the proportion of its population served by water that hasn't been adequately tested, states such as Texas also have large numbers of violations that affect millions of people. There is nationwide pressure on states and utilities, as well as on the EPA, to do better. A July report by the inspector general for the EPA found the government had failed to make sure the water in Flint, Mich., was being treated and tested effectively. It also faulted the EPA for communicating poorly with the state, and being too slow to step in when it was clear the state was not enforcing the law. Another federal report released in July found widespread failures to test for lead in the drinking water of schools across the country. A bill currently moving through Congress would requires states to improve the accuracy of their reporting when it comes to the results of drinking water tests. It would also push states to consolidate systems that are struggling to comply with safe drinking water laws. Such a change could affect Puerto Rico more than any other state or territory, as the island has the most fragmented drinking water infrastructure in the country, with more than 200 systems serving a population similar to the Minneapolis metro area. "People are shocked at how complicated it is," says Ramirez-Toro, who has served on numerous national working groups about water safety. And then there's the issue of money. Scientists, public health experts, government officials and advocates all agree that Puerto Rico needs serious investment in its drinking water infrastructure. The head of the utility, Díaz-Atienza, says he is requesting $2 billion in infrastructure spending over the next five years. That money might actually materialize, since federal government approved more than $20 billion in community block grants for the island to rebuild and improve housing and infrastructure. "The infrastructure funding is absolutely necessary," says Brent Fewell, a drinking water lawyer in Washington, D.C., and a former senior official at the EPA's Office of Drinking Water. But, he says, money isn't the whole answer, because a lot of drinking water testing is done by hand, by actual people. "What I would say is, money is not going to fix the culture," he says. "If you've got a broken culture, [employees] that don't understand the law or simply do things their own way, extra funding is not going to fix that. What will fix that is leadership." Fewell is hopeful on that front. "I do know the leadership in Puerto Rico, and they are doing the best they can," he says, referring to Díaz-Atienza and the territorial government. "They are trying to change the culture there." Díaz-Atienza says he hopes to devote some money in the coming years to training for people who operate local water treatment plants. This week, the EPA announced it is funneling $10 million in technical support and financial assistance to small, independent, rural systems that have also struggled to treat and test drinking water. But such investments will play out over years. In the short term, it's hard to imagine restoring public trust in the water that comes out of the tap in Puerto Rico. Asked what the utility could do to regain her trust, resident Carmen Lugo shakes her head. "I don't know," she says. "Rebuild the whole system? Or?" She waves her hand like she's holding a wand, and laughs. Maybe magic would do the trick. Hurricane Maria slammed into Puerto Rico exactly a year ago. It devastated the island, which already had major infrastructure problems, including with its drinking water system. NPR's Rebecca Hersher went to Puerto Rico where she found water testing is not what it should be. FERNANDO ROSARIO-ORTIZ: I guess low flow like last time. To make sure that you don't spill, just fill it up. REBECCA HERSHER, BYLINE: It was a sweaty day this past July, and professor Fernando Rosario-Ortiz was going door to door in Puerto Rico gathering bottles of water from people's bathroom sinks. HERSHER: Rosario-Ortiz is a chemist at the University of Colorado, but he grew up in Puerto Rico. ROSARIO-ORTIZ: I drank water out of the tap every single day of my life. HERSHER: Hurricane Maria knocked out power and water here last year. And after the storm hit, Rosario-Ortiz set out to test drinking water on the island to make sure it was safe. Initially, he was looking for bacteria and viruses that officials were worried might have contaminated the water after the storm. But Rosario-Ortiz found something else. ROSARIO-ORTIZ: When we got the data back, we noticed that some of the levels of lead were elevated. HERSHER: Now, Rosario-Ortiz has the calm demeanor of a data-driven scientist, which he is, but don't let his tone fool you. He was very concerned about these high lead levels. And his concern only grew because when he went to check the public data reported by the Puerto Rican water utility, he found they hadn't been testing for lead the way they were supposed to under the Safe Drinking Water Act. ROSARIO-ORTIZ: There's a fair number of lead and copper rule violations that seem to be mostly lack of sampling. HERSHER: Basically, some of the test results that should be there are missing, which means it's impossible to know whether the high lead levels Rosario-Ortiz has found, both initially and in follow-up tests, are outliers or part of a larger problem. The data just don't exist even though it's required by federal law. ERIK OLSON: Unfortunately, Puerto Rico has the worst record in the United States for drinking water safety. HERSHER: Erik Olson is a drinking water lawyer at the Natural Resources Defense Council. OLSON: Virtually everyone on the island is getting water from systems that violate testing or reporting requirements. HERSHER: That's according to NPR's analysis of the most recent federal data reported by Puerto Rican water authorities between January 2015 and March 2018. Ninety-seven percent of Puerto Ricans are being served by a water system that's either failed to test for lead at least once or failed to notify residents of test results that could impact their health. OLSON: And it's sort of a see-no-evil-speak-no-evil kind of situation where if you don't test the water as the law requires, you're not going to know if you have a big problem. HERSHER: But the public official in charge of Puerto Rico's drinking water says the data makes the problem seem worse than it is. Eli Diaz-Atienza is the executive president of Puerto Rico's public water utility. ELI DIAZ-ATIENZA: I would grade it as one of the best functioning systems in the U.S.
HERSHER: Diaz-Atienza acknowledges there is room for improvement when it comes to keeping up with water testing. DIAZ-ATIENZA: Well, I think it's a problem that we're not doing testing. Yeah, I think it is a problem. HERSHER: But he says a lot of the violations happen because unlike most parts of the U.S., water service in Puerto Rico is pretty unreliable a lot of the time. When the water is off, they don't test it. And he says despite missing data, the utility doesn't have any reason to believe it has a lead problem. DIAZ-ATIENZA: We haven't seen situations of lead contamination in our system. Again, we don't have that much - you know, old - that type of piping. HERSHER: That is, the water mains and the pipes at water treatment plants don't have lead in them, he says. But lead contamination doesn't have to come from public pipes. It can come from pipes inside people's homes. And to test for that, you have to test the water inside houses, houses like Carmen Lugo's. HERSHER: Carmen has three kids, and she says she doesn't let any of them drink the tap water. HERSHER: What's she afraid of? UNIDENTIFIED PERSON: (Speaking Spanish). Everything? HERSHER: "Everything," she says - bacteria, viruses, chemicals and lead. And indeed, an initial water test done by that scientist, Fernando Rosario-Ortiz and his team, showed lead levels in her home that are higher than the federal health threshold. Same with a handful of other homes of the dozens he's tested so far. Lead in the water is bad news for sure, but it's also good to know. A team from Interamerican University of Puerto Rico is working to get residents like Carmen water filters if they need them. But Rosario-Ortiz says although it's good for research, this kind of small-scale testing doesn't fix the underlying problem - years of public failure to make sure the water that comes out of people's taps is safe and that people know that, both by investing money and communicating with residents about their water quality. ROSARIO-ORTIZ: The reality is, I think, there's also some long-term issues related to the distrust of, you know, water systems, water supply and - you know, ultimately, we need to deal with that as well. HERSHER: The first step in restoring trust is cash. The federal government has approved more than $20 billion to rebuild Puerto Rico's housing and infrastructure. The EPA announced this week that it's funneling 10 million specifically to Puerto Rico's rural drinking-water systems, and the water authority is asking for 2 billion in budget over the next five years to make sure the water that comes out of Puerto Rican taps is safe. Rebecca Hersher, NPR News. Transcript provided by NPR, Copyright NPR.